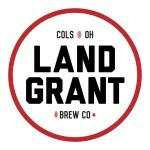 For the 300th batch of Land-Grant beer brewed at our Franklinton production the brew team wanted to whip up something special, a beer that exists outside of our M.O. To truly celebrate the occasion, we developed the single malt Imperial IPA you see here: brewed with Floor Malted Bohemian Pilsener Malt for a lighter body, and the most hops we’ve ever poured into a beer. Citra, Mosaic, and Moteuka hops shine through with a citrusy mojito-esque punch of lupulin. Here’s to 300 more!